This is a guest post from Jason Fitzgerald of Strength Running. Ask most runners about what prevents injuries and they’ll list the crowd favorites: strength exercises, good running form, and increasing mileage at a responsible rate. And it’s true – any smart runner should work on these aspects of their running to stay healthy. But mention trail running and a flash of fear usually crosses their faces. What happens if a trip over a rock? Don’t you have to be an ultrarunner to do trail running? Isn’t it way too hard for beginners? Will I fall off the side of a cliff? Let’s clear the air: trail running isn’t much more difficult and you can start any time! Even if you’re training for road races or just running for health benefits, hitting the trails can help you race faster, stay healthy, and have a lot more fun. The often overlooked aspect of trail running is that it’s not more dangerous. The only “real” danger of trail running is that you might trip on a root or rock. But you could easily fall on the roads by tripping on a curb, pothole, or fire hydrant (I’ve done all three). But trail running offers some serious benefits that can help you prevent injuries and stay healthy in the long-term. Most trails are very different from road running in that the elevation tends to be much more variable. This undulating terrain of rolling hills can be used as a valuable training tool to help you stay healthy. That’s because hills are sneaky. Running hilly trails is like going into the weight room and doing squats – it builds a lot of strength! And hills are more specific to running than lifting weights because, well, you have to actually run up them. You can start by choosing a hilly route that offers a few challenging climbs during a regular distance run. Once you’re comfortable with varying elevations, you can hit the real gnarly trails that have steep ascents and long, continuous climbs. Trail running also has the unique quality of uneven terrain. Almost any trail will require you to dodge rocks, sticks, roots, holes, and snakes (believe me, it happens). Instead of running in such a straight line, there are more curves and turns that force you to change direction more often. So, you might be asking yourself, how is this a good thing? Does rocky, uneven terrain with a lot of turns help me stay healthy? My answer is an enthusiastic yes! As long as you don’t sprain an ankle or break your foot falling over a tree stump, these subtle variations can absolutely help you prevent injuries. That’s because most people’s training is incredibly repetitive (the same pace, route, shoes, goal race, etc.). And running injuries are really repetitive stress injuries – they’re the result of too much wear and tear from the same motion, repeated over and over again. Trails help reduce that repetition by making you change your stride slightly, take shorter steps in between obstacles, and switch directions much more often than if you were on the road. Instead of the same exact running movement like you would on an unchanging even surface, you’re performing a slightly different movement because you have to accommodate the uneven terrain. This variation distributes impact forces from running differently, reducing your risk of a running injury. Helpful, isn’t it? If you’ve never run trails before, your first run will probably leave you feeling sore in all kind of odd places. But this is a good thing! You’re using more stabilizing muscles than you would on smooth, even surfaces so it’s to be expected – and welcomed. Don’t worry, it won’t last long! Spend a morning running around Rock Creek Park with Doug and you might notice you’re running slower than usual. With more hills and technical terrain, it’s no wonder that you have to slow down for all those obstacles. But running slower can help you prevent injuries. Many runners tend to run most of their runs too fast anyway, having too many moderately hard days instead of easy days. You might be wondering just how slow you should run on trails as opposed to the road. That’s a tough question to answer because it depends on the terrain. The hillier, more technical trails might slow you down by 2-3 minutes per mile – or more. 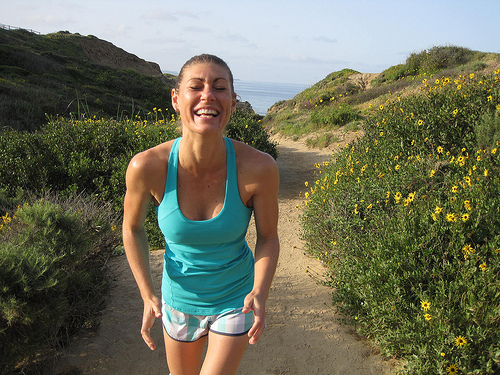 It’s helpful to run by feel instead of a strict pace when you’re on the trails. You’ll naturally slow down on hills or when you’re avoiding an obstacle so focus on your breathing and how your legs feel rather than your Garmin. Effort, rather than a specific pace per mile, is what really counts when you’re trail running. Let’s say you usually run at 9:00 per mile on the roads. A typical 5-mile run will take you 45 minutes. But on a more technical trail that same 5 miles might take you as much as 55 minutes – a whole ten minutes slower! As a coach, I don’t really care if one of my athletes runs that much slower on an easy or moderate day. It simply doesn’t matter. Just keep your faster workout days on the roads or track so you can focus on running the pace you need. This section alone could be an entire book (and indeed, here’s a complete guide to prepare you to start trail running). But what if you just want to experiment once or twice a week? What’s the absolute minimum you need to know? The beauty of running is that it’s largely an exercise in exploration and discovery. It doesn’t have to be complicated. It can be really simple. Run. Get lost a little bit. See the world. Never stop exploring. Jason Fitzgerald is a 2:39 marathoner and USA Track & Field certified coach. Get the latest training tips at Strength Running – or sign up for a free email series on injury prevention for runners. Trail Running can avoid many injuries. Thank you for sharing this information. Starting from a slowly running is a good idea. For safe running sports should read this article. Thank you – very handy!